I’m not an athlete by any stretch of the imagination. Kayaking and walking are about it for me when it comes to breaking into a sweat from exertion, but it doesn’t prevent me from hopping on the bandwagon and cheering for the athletes that stand up on the podium proudly holding their medal as their national anthem is played. As the 2014 games begin, my thoughts turn to the history of these Ancient games and how music, and choral music in particular, reflects its pomp and ceremony. And more than any other type of music, I believe it honours the ideals of the Olympic Games – the coronation of excellence, the spirit of peace and unity among nations, and above all, the strength of the human body and spirit. Athletic games were held many years ago and became organized in 776 BC into festivals held every 4 years. The formalized games were a result of a peace treaty between two city States of Elis and Pisa. 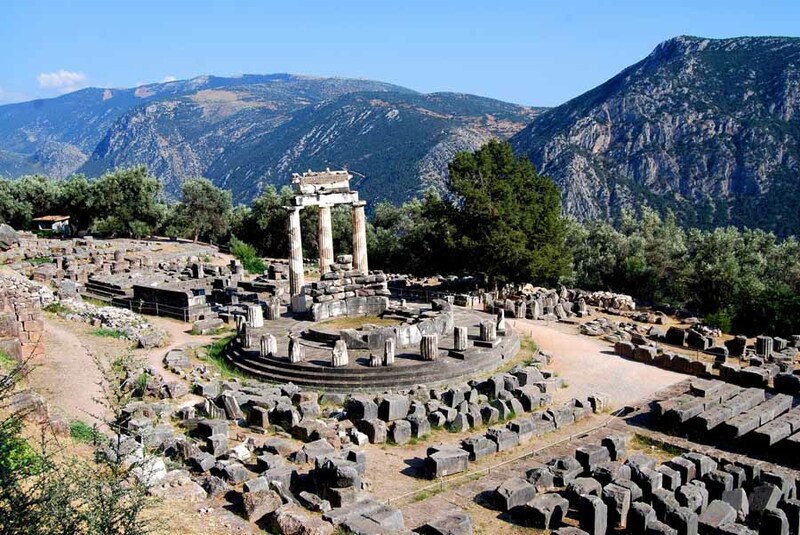 There is an often repeated story that the origins of the Olympic games began when the Delphic Oracle told King Iphitos to plant an olive tree which would supply the cuttings for the wreaths crowning the victors. In Ancient Athens in the wooded valley of Olympia, there burned a flame in honour of Zeus, the lord of all the gods, all powerful, all wise, the almighty ruler. Greek composer Mikis Theodorakis wrote ‘Canto Olympico’ for the 1992 Barcelona Olympic Games. Music for the 1992 Olympic Games in Barcelona. Commissioned by The International Olympic Committee. When I was looking up info on Hercules I noticed that many websites mentioned a myth that gave Hercules credit with founding the Olympic Games. “In his fifth Labour, he agreed with king Avgeas of Ilia, to clean his stables, and in exchange would receive one tenth of his cows. Avgeas did not keep his promise and Hercules declared war, which he won.” After the victory, and in honour of his father Zeus, he began the Olympic Games. 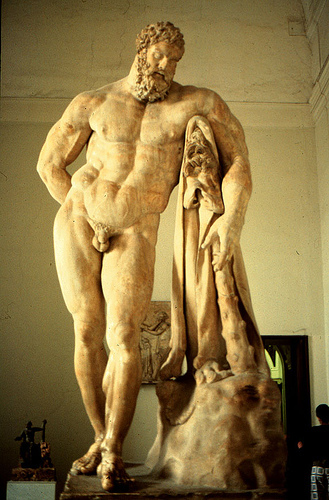 Hercules, a man of great sport, ran and he taught men how to wrestle. In 394 Emperor Theodosius I abolished the games because of corruption and tensions between the Romans and Greeks. The Olympic stadium was razed and the walls surrounding the Olympic fields were destroyed. Discussions for reviving the games began in 1793 but there wasn’t any international will or money to pull it off. 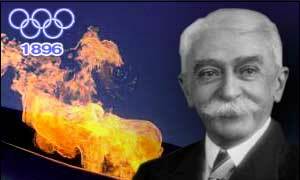 In 1894 Baron Pierre de Coubertin (French publisher) was speaking at an international gathering of sports leaders from 9 countries and he suggested that the games be revived. He formed the International Olympic Committee (IOC) to organize the games and make the rules. The IOC declared that all competing athletes had to be amateurs and they decided to hold the first modern games in 1896 in Athens. Funds were raised by public and personal donations and by the sale of 8 different Olympic stamps. It was during these first modern Olympics that the Olympic Anthem was performed for the first time. 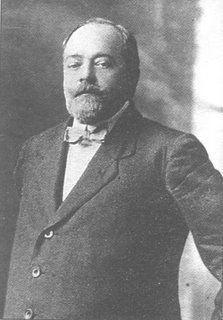 Spiros Samaras composed the music and the lyrics were penned by Costis Palamas. In 1958 at the 55th IOC Session in Toyko the IOC members unanimously adopted this work as the official Olympic Anthem. Vivaldi’s 1734 opera ‘L’Olimpiade‘ is jam-packed full of Olympic drama, and the characters aren’t just playing for gold and glory. The plot centres around Megacles, who arrives in Sicyon in Greece just in time to take part in the Games, where the prize is the hand of princess Aristaea. the whole of life a sea. One of the most famous Olympic stories was immortalized by Hugh Hudson’s Oscar-winning movie, ‘Chariots of Fire‘. The heroes who ran for Great Britain in the 1924 Paris Olympics were Eric Liddell a divinity student and Harold Abrahams a Jew. They had to overcome the hurdles of class prejudice and anti-Semitism. This is Vangelis’ arrangement of ‘Jerusalem‘. It won for him Hollywood’s much coveted golden statue. Spirit and unity among the nations. That is the Olympic ideal. In Ancient Greece, fighting would cease as implements of warfare were exchanged for a discus or javelin. Friendship is the real reward. For me, the most thrilling moment of the games is the opening ceremony when all nations flags are flying high and ear to ear grins light up the faces of the world’s best athletes. They have sacrificed their time, bodies, finances and offer their best for their team and their country. Welsh composer Karl Jenkins wrote his ‘Songs of Sanctuary’ based on the European classical tradition but the vocal sound is more evocative of world music. Jenkins invents his own text made up of phonetic sounds to symbolize the universal language of music. ‘Adiemus’ means ‘We will draw near.’ Jenkins writes: ‘The human voice is the oldest instrument and by removing the distraction of lyrics, we hope to create a sound that is universal and timeless. The knowledge that Adiemus has a meaning invokes what I feel to be an appropriate concept of bringing people together. Being a very proud Canadian I conclude my musings with wishes for safety and health at the 2014 Sochi Olympics for athletes and visitors. I cheer from this corner of Toronto for your success, and I’ll be singing loudly and proudly when I see our beautiful maple leaf being raised.